Ivy Brambles Ramblings: Romantica, hot for 2010! Hot for 2010 was our new Romantica yarn, now available in 38 colors and growing. The latest additions are some of the original variagated colorways and also some new ones, added earlier this year as sock yarn colors. 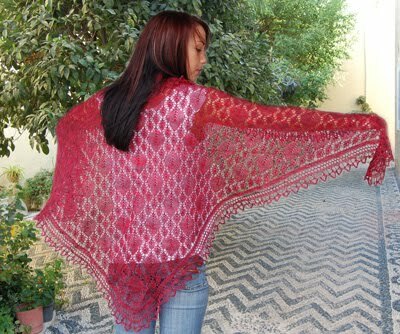 A top pick for lace enthusiats is the Halo Pave shawl, which uses just one skein of Romantica and is shown in the most popular color Autumn Flame. This shawl is not terribly difficult, the center panel being knit and then the border being added later. This keeps the pattern work straight forward and results in a garment that has superior drape. For those looking for a less challenging project the Sunrise At The Beach shawl utilises the color changes in the variaged colorways to stunning effect. 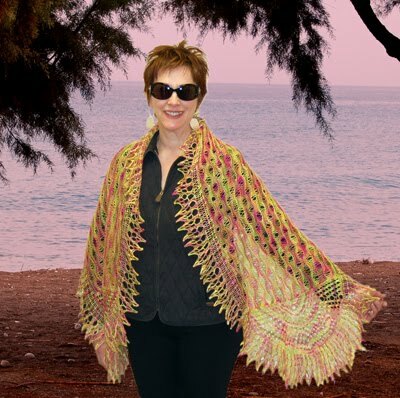 Shown in the Sunrise colorway this shawl uses less than one skein and can be finished fairly quickly. Our newest variageted colorways, also available in SockScene, are Hydrangea, Deep Sea, Wildflowers and Dark Nebula. These colors have been very popular this year and we expect them to continue to be for 2011. Look out for new patterns coming in 2011.